How similar are they?Twelfth Night and SheÃÂs the Man were made just about 400 years apart from each other and still the writers were able to modernize the play from 1600 to reach an audience of 2006. Some of the easier similarities they were able to make were character names and the plot, but they also worked in some character traits which is very hard to do when the target audience is that much different. There were also many differences due to them being made in different time periods. The use of language was much different as was the target audience and events that occurred during the play. In this report I will compare and contrast the characterÃÂs names and traits, use of comedy, and who is the target audience. The easiest part for SheÃÂs the Man to reference was the characterÃÂs names and most character traits. The main characters name is Viola, who dresses up as her twin brother, Sebastian, so she can play on the boyÃÂs soccer team. Viola and Sebastian are twins in both play and movie. Viola falls in love with Duke, while dressed up as a man, and Duke has feelings for Sebastian but knows there wrong because itÃÂs another guy. And Olivia falls in love with Sebastian, who is really Viola. DukeÃÂs friends from Twelfth Night, Andrew and Toby, are his friends on the soccer team in SheÃÂs the Man. Paul is ViolaÃÂs friend and Paul is AntonioÃÂs last name in Twelfth Night. In the play, Viola dresses as a man because she needs to be male in order to get a job and survive, just as Viola "needs" to disguise herself in order to get on a soccer team in the movie. Malcom, who plays MalvolioÃÂs character, has a pet tarantula named Malvolio. Malcom has the traits of Malvolio as he is very nosy and gets into peoples business as he did in the play. He is also wearing yellow in the final scene like he was told to do in Twelfth Night. The character traits in SheÃÂs the Man are much different than they were in Twelfth Night. Duke was much older than Viola in Twelfth Night, and in SheÃÂs the Man they are the same age. Sebastian intentionally leaves in the movie while in the play Viola thought he had been swept out to sea in a ship wreck. The characters that were in Twelfth Night had a variety of ages and the ones in SheÃÂs the Man are the same age going to the same High School. MalvolioÃÂs name is not the same in SheÃÂs the Man they instead named his pet tarantula that. All the main characters are interested in soccer while there is nothing similar to that at all in Twelfth Night. Really none of the characters traits are the same in the movie as they were in the play. They do similar things as in the obvious Viola dressing up as her brother but other than that, they donÃÂt mimic each other. If they had tried to copy the play strictly though, it wouldnÃÂt have been original and it wouldnÃÂt have targeted a specific audience. The target audience for Shakespeare when he wrote Twelfth Night was the upper class or the people who could afford to go to plays and enjoy the arts. He wrote it for anyone and everyone pretty much who had the resources to be able to see it. ItÃÂs written all in iambic pentameter and the only characters who donÃÂt speak like that are the lower class citizens who are comic relief in a comedy play. ItÃÂs somewhat tough to compare target audiences from the 1600ÃÂs and the 2000ÃÂs. Plays were written as drama, tragedy, comedy, etc. back in the 1600ÃÂs and they still are today but they are advertised to be targeted at certain audiences. SheÃÂs the Man was written for a younger, teenage audience. It was written for strictly entertainment, not to teach a lesson or really have a moral to the story. SheÃÂs the Man is teeny bopper, so it attracts to its audience, which was mostly teenagers. It was written for entertainment. Twelfth Night used the clown for comedy not physical humor, and it also had Malvolio who was almost a tragic character stuck in a comedic play. Shakespeare used Malvolio to pull away from the comedy a bit and show how people can be cruel and take jokes too far. If SheÃÂs the Man had done that its target audience might have lost interest so while there are some serious scenes in the movie, it was still written for a much different audience than Twelfth Night was. The comedy between the plays was different because comedy used to be much different. Both the play and the movie used the love triangle which turned into a love square for comedy. It is comedy that plays out throughout the entire play/movie to keep you interested. 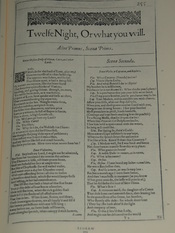 Twelfth Night used the clown for a lot of its comedy. He would upset certain characters while joking around with them and pretended to be a priest when he went down and talked to Malvolio who was locked in the dungeon. Also in Twelfth NightMalvolio was a comedic character when he dressed up in his silly outfit to try and impress Olivia. In SheÃÂs the Man the comedy was much different. They used things like physical comedy, an ugly girl with braces who was attracted to every guy, and a very strange principal to get you to laugh. Also right when Viola was acting like Sebastian, Viola seems to forget sheÃÂs Sebastian and starts talking like a girl or she gets really close to Duke like sheÃÂs hitting on him. She also talks like a girl a lot before remembering she has to act like a guy and starts being tough. There is also the scene at the carnival where she has to keep changing her appearance back and forth between Sebastian and Viola and play both people in the same day. Never in Twelfth Night did Viola have to act as a male and a female on the same day. The physical comedy in the play usually happened when they were playing soccer. In one scene Viola is hit by the ball and realizes for a guy it would hurt and has to start screaming out in pain like its causing a great deal of hurt for her. So between SheÃÂs the Man and Twelfth Night there are really not a lot of similarities. The movie did a good job of throwing the plays characters name into it even if they would just use the names for a pet or a pizza shop. Overall though, those were the only strong references to the play. Both plays were written for entertainment but with a 400 year gap in-between them, there is bound to be many differencesSources CitedShakespeare, William. Twelfth Night. Boston: Bedford, 1999. SheÃÂs the Man, Andy Fickman, Amanda Bynes, Channing Tatum, Dreamworks"She's the Man." Wikipedia. 12 Dec 2007 . WriteWork contributors. "Shakespeare vs Bynes" WriteWork.com. WriteWork.com, 06 February, 2008. Web. 24 Apr. 2019.